Differential Scanning Calorimetry (DSC) measures the heat changes that occur during controlled increase (or decrease) in temperature. A biomolecule in solution is in equilibrium between the native (folded) and its denatured (unfolded) state. The higher the transition midpoint (Tm), when 50% of the biomolecules are unfolded, the more stable the molecule. 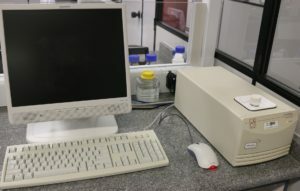 DSC is also used to determine the change in heat capacity (ΔCp) of denaturation. DSC can elucidate the factors that contribute to the folding and stability of native biomolecules, including hydrophobic interactions, hydrogen bonding, conformational entropy, and the physical environment. In LEC we have the ITC-Vp Microcal – GE (see support material).